I was cheeky when I selected the theme to this Monthly Mingle. Hope you will excuse me for that. You see the reason I chose this theme was because I had just bought a wonderful new cookbook - Sophie's Sweet and Savory Loaves by Sophie Dudemaine. It is a fantastic cookbook and comes with my very high recommendations. It features several cakes and loaf recipes that are sorted according to the season. There is such a large variety to choose from and I was having a hard time doing that. So, I decided to make the theme for the Monthly Mingle Savory Cakes to push me to make one of the delicious cakes. I then narrowed all my selections to a fantastic sounding loaf. 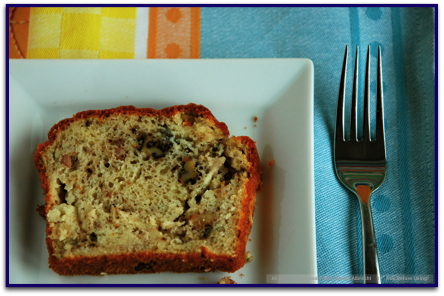 A loaf with walnuts, bacon and Roquefort cheese. What I love about this book is that Sophie has combined brilliant ingredients and each loaf is a culinary artwork. So you have a cake with apples and pistachios, cake with zucchini and goat cheese, cake with asparagus and chantrelles, Foie Gras Cake (my next choice), smoked salmon cake, rice pudding cake ..... the list goes on. As the recipes are sorted according to season you can choose fresh ingredients that are in season. Just brilliant. 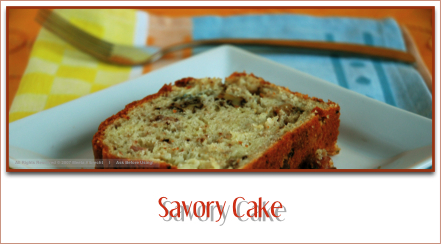 Savory cakes/loaves are so perfect for a light dinner with a salad or a soup or packing it as a picnic lunch. Something I am looking forward to this Spring and Summer. They make perfect bread type sides for your party buffet too. The loaf I chose just fitted into my mood that day. I was craving for something nutty, cheesy and smoky - this loaf offered all that and more. It has a very "grown up" taste to it, as the flavor of Roquefort cheese lingers on the tongue. If you have not developed a taste for blue cheese I would recommend simply using less of the Roquefort cheese. But I do recommend everyone to give this loaf a try. For the vegetarians I suggest using some mushrooms instead of bacon. This cheese is made from sheep's milk and is one of the world's oldest known cheeses. It was enjoyed by the Romans and was Charlemagne's favorite types of cheese. In 1411, Charles VI of France gave sole rights to the ageing of Roquefort cheese to the village of Roquefort-sur-Soulzon, and all Roquefort still must be aged in the caves there today. The blue veins are mold that originally came from the walls of the limestone caves in the south of France where the cheese is aged and ripened. Nowadays the mold is injected into the cheese to allow for even distribution. It is still aged in the same caves. All "real" Roquefort cheese have a red sheep brand on the foil label. Roquefort has a creamy and rich texture. Taste wise it is pungent and slightly salty. The interior is creamy white dotted by the blue veins of mold and surrounded by a white rind. 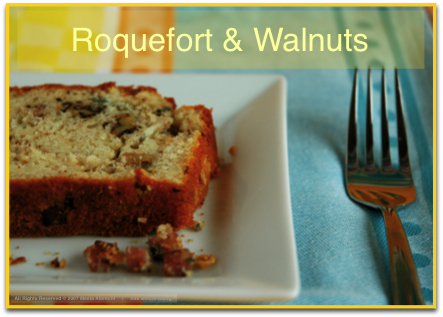 Roquefort can be used in a wide variety of preparations from savory breads to Canape spreads. Don't forget March 15th is the last day to enter your own Savory Cakes for the Monthly Mingle. Sunrise Avenue - Fairytale Gone Bad: New on my iPod - totally hot. Updated: You can now easily find and buy the cheeses I used in this recipe at the WFLH Mall. Pre-heat the oven at 180 degrees Celsius. Grease a loaf pan. In a pan heat the sunflower oil and fry the bacon until brown and crispy. Add the walnuts, salt and peeper and continue to saute on a gentle heat for approx. 5 minutes. Set aside and allow to cool. In a bowl mix together the flour and baking powder, add the eggs and beat well with an electric beater. Gently drizzle the oils and warm milk into the batter, beating continuously. Fold in the Gruyere cheese. Crumble the Roquefort cheese over the bacon and walnut mixture. Mix and then add to the batter. Fold together gently. Pour the mixture in the loaf pan and bake for approx. 45 minutes. Vegetarian tip: Use mushrooms, like porcini or chantrelles instead of the bacon. Like I said above a very grown up tasting loaf. Powerful from the Roquefort, nutty from the walnuts and smoky from the bacon. It is amazingly moist and soft. We had a side of fresh mixed salad with this and it was just the perfect dinner. For Soeren the Roquefort cheese taste was somewhat piquant and I think he will need to develop the taste for this. But he still ate one slice with relish. Tom loves cheese and a good Roquefort is on top of his list. This was a great success with him. I want this blog to be a wonderful experience for my readers. You know I love playing hostess. That is why I have added a few comfortable resources on my sidebar for you to browse through and refer back to. I joined up with the Amazon affiliate program to be able to offer you the items I discus and mention here with an easy click of your mouse. Music, cookbooks and other interesting items are available at the What's For Lunch, Honey Mall. There is a place for Amazon.com and Amazon.de shoppers. You will find the link and featured articles on my sidebar to the left. You must have noticed that I have added a second sidebar to my layout. The right sidebar focuses on food related things on WFLH and on the left sidebar I concentrate on other interesting tidbits, like photography and music. The "Spotlight on the Archives" section on the right sidebar highlights some of the interesting recipes I shared with you in the past year. Check out the "Daily Tiffin Latest" section regularly too. Here you can inform yourself of what is being currently discussed over at the Daily Tiffin. This week: Childcare: Making the choice. You will find this on the left sidebar. I hope you enjoy yourself discovering and sharing a world full of life with me! Hm, walnut and roquefort. You make me hungry! Glad I haven't missed the deadline for the Mingle. I'm making my savoury cake tonight! Yours looks wonderful! Wow, that looks wonderful! And thanks for the vegetarian recommendation....would it matter to the texture of the cake if used a more available cheese like cheddar or gouda? Anh Well come on over for a piece! Bri Yes, it really is. I have taken a real liking to the two together. Viji Thanks for your comments. It is a great combination of flavors. Rasa Thank you. Glad you liked it. Freya/Paul Never quite know which one is writing LOL! I am looking forward to your entry too. I love your combinations. Check out Beautiful Beat for great tips on template design. Nandita No I don't think so. YOu know what I say give it a go. With each try you'll improve it. The only think it would make a difference in is the taste. I just posted another recipe from Sophie Dudemaine for your mingle. This time I had more luck than the last time. What an amazing recipe, I'd love to try it. I didn't get a chance to join the MM this month, but I can't wait to see the round-up! you are an absolutely brilliant photographer! i can not wait to make this loaf. i adore roquefort! Wow, you've been doing the dance haven't you. Beautiful new layout!! It will take a time to get used to! Nice job. Really like the roquefort and walnut! Your photos are amazing and so are your recipes! Wonderful! Your Photos are wounderful! !Today Itself I got 2 recipes for Savory Cakes.Thanks for Sharing..
You are such a gracious host and I love the new design. My mom gave me Sophie's books on creps, cakes and jams but so far I have only liked the one on madeleines,...I need to try again. My brother gave me the one in which she cooks with Ducasse but there is so few things I can find here I gave up! at least the pics are nice! Meeta, this looks great! Fabulous idea for alight dinner too. Now I know what to do with that hunk of roquefort that has just been hanging out in my fridge. Thanks again for a fun event- yours is always my favorite! Then there are at least three of us who made a "Sopie-Cake" for the mingle... funny isn't it? This was great! I had to do some calculations as I am in the US but it was a big hit in my house. Keep it coming!